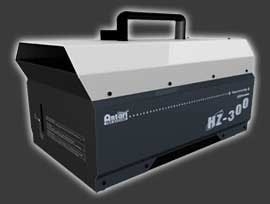 Antari's professional hazer, it is capable of producing very large quantities of haze quickly and quietly. The specially designed air compressor is vibration free and operates virtually silently. In addition, with the built-in on board DMX, operators are able to easily control the unit completely and without difficulty. The HZ-400 will provide very large amounts of fine, translucent haze in any environment. This unit uses mineral oil-based haze liquid. Output: 1,700 cuft. / min.